Robert Goldsborough was a revolutionary through and through. He proudly supported his country and, though most of his accomplishments were at the State level, he served in the Continental Congress. Unfortunately, he was just never in the right place at the right time as he narrowly missed signing most of America's Founding Documents. Robert Goldsborough was educated in Europe and America, practicing law in both of those countries. Introduced to politics by his father, Robert became Sheriff in Dorchester County, Maryland while still in his 20’s. By 32 Goldsborough was elected to the Maryland Assembly and was appointed as the colony’s Attorney General the following year. Robert Goldsborough was firmly against the Stamp Act, as well as all the abuses of Parliament which followed. When Maryland sent representatives to Philadelphia to the First Continental Congress, Goldsborough was one of the men chosen. It is my understanding, however, that he did not attend this event. I have searched every document available to me and I do not see his name recorded in any debates, nor in any of his contemporaries’ diaries. Additionally, his name was not applied to the Continental Association, which was the first Founding Document in the creation of the United States. It is my belief that he did not attend the First Continental Congress. Eventually, Goldsborough did arrive in Philadelphia. After war had broken out, Robert found a way to get to the Second Continental Congress. Seeing that he was playing a very small role in this Congress, Goldsborough decided to return to Maryland where he could get more accomplished. This was in May 1776. Had Robert stayed just two months longer, he would have been able to sign the Declaration of Independence, America’s second Founding Document. Upon returning to Maryland, Goldsborough assisted in drafting that State’s first constitution. He was soon thereafter elected to serve in the inaugural State Senate. Robert stayed in this position for the following decade. When, in 1787, the Constitutional Convention was called in Philadelphia, Goldsborough was again selected to represent Maryland. This time, gravely ill, Robert’s health prevented him from taking the trip to Pennsylvania. He narrowly missed his third chance at signing a Founding Document. Robert Goldsborough died the following year, his place in history diminished because he just couldn’t get into the room when the Documents were being signed. A lot more of us would probably know Robert Goldsborough's name if he signed any of these papers. You'd know a lot more Founder's names in general if you subscribe to our email list. If you're already a subscriber (or if your not) let me know who you'd like to hear about next in the comments. 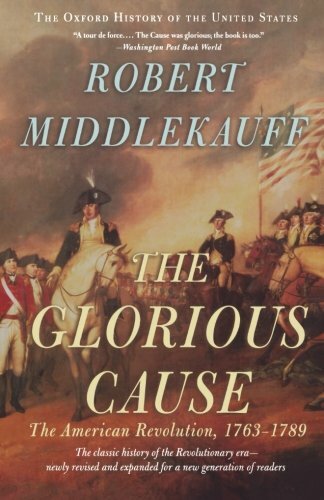 Since no biography of Goldsborough is available, I'm recommending today 'The Glorious Cause.' It is part of the Oxford History of the United States series and, therefore, is a serious read. If you are a big fan of the American Revolutionary Period, however, it is a must. Our link goes through our affiliate bookseller, Amazon.